Each day brings a new set of challenges for process manufacturers. While each manufacturer is faced with slightly different challenges, there is a common list among them. Some of the challenges need to be addressed with personalized company policies and well designed SOP's; other challenges can be addressed through implementation of an integrated ERP system. 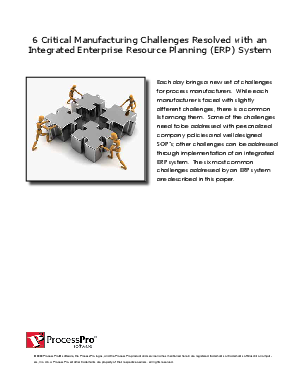 The six most common challenges addressed by an ERP system are described in this paper.